There’s still a chance Chelsea win the Premier League, but it’s probably not going to happen. 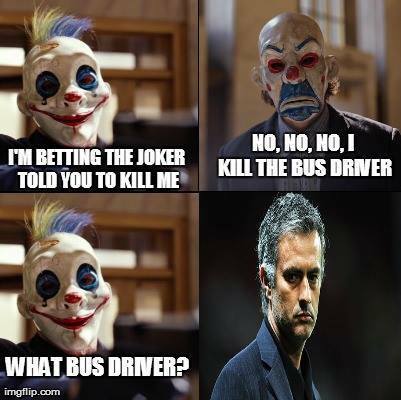 Jose Mourinho has gone on once again to explain a failure on the pitch with spins and by hinting that the other team used defensive tactics, something he is the master of, which obviously didn’t take long to get some hilarious replies, memes and jokes from across the web. A 0-0 draw at home against Norwich, making it yet another disappointing result against a bottom feeder in the Premier League. Mourinho said he expected Norwich to be a bit more attacking in the second half because of their situation. People also expected for Chelsea to be a little bit less embarrassing when they played in Madrid against Atletico or at Anfield against Liverpool. No more big matches for Mourinho this season, no more managers to have wars of words fights through the media. Right now his main concern is damage control, while trying to make it seem like he has given up on the title, although deep down he knows things aren’t as over as he’s trying to make them seem. The damage control part is about making himself look good. Gallant, for choosing Chelsea as his next job, where the challenge is greater (???). Great manager, for winning against the big clubs, but neglecting to mention in the same breath how his team has dropped so many points against teams from the bottom half. In Mourinho’s world, no one has the right to say he’s wrong. Looking a bit deeper inside might give him the enlightment that this season is quite close to being a failure, like his Real Madrid tenure.